courtesy of JP Aerospace. Learn how to send your logo to space. There can't be a hobby without hobbyshops and now the internet offers plenty of places to shop for space hobby related stuff. Some of these space shopping sites provide a general catalog of space items while others specialize. Space bookstores are also popular. Now a number of space services are available as well. These consumer services include direct-to-home satellite TV, 2-way broadband internet to the home, digital satellite radio, and GPS. to launch to space in the fall of 2006. Several companies now offer tickets to fly on suborbital spaceflight vehicles. The first such vehicles are expected to begin test flights by late 2007. It is also possible to obtain a flight to the ISS for around US$20M. The Space Tourism section provides lots of information about this kind of service. Here is a list of travel agencies that provide not only spaceflight packages but also astronaut training, "zero-gravity" on airplanes flying parabolas, tours of spaceports, etc. Wildwings is a UK based travel company that offers various adventure tours, such as trips to Antarctic. It is now developing a space tours package. WildWings is the UK Sales Agents for Space Adventures Inc. (see above) and is taking deposits on suborbital flights. Space Adventures - partnering with Armadillo Aerospace. Several companies now sell rides into space for small payloads such as school science projects, collectables and memorabilia, etc. Most of these companies currently provide only suborbital spaceflights. Bigelow flew personal items on the Genesis II spacecraft launched in June of 2007. However, they have suspended the program for future spacecraft. Altitude from 25,000 feet (7,600 m) up to 70 miles (113 Km). Masten-Space Systems - suborbital flights on a vertical-takeoff-and-landing vehicle. Still in vehicle development stage. Low altitude flights could begin in 2010. 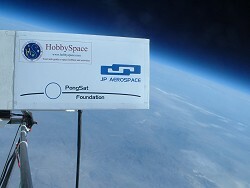 Photos to Space provides the public the opportunity to participate in space flight by sending their own photos to space for a small fee. Falcon flights are available for small payloads. Here are some foods and drinks with a space theme. Vostok Space Beer - This Australian beer is promoted as a beer for space tourists. It will be tested on microgravity parabolic flights for its taste. Final Frontier Jerky - Gregory Nemitz, businessman and space activist, ran the firm Beef Jerky.com. He succeeded in 1996 in sending a package of his Final Frontier Jerky to Mir via the shuttle mission STS-79. By all reports, the jerky was a great hit with the astronauts and cosmonauts. An article in Space News (April 23,2001) reported on his efforts to get a delivery of his popular space food to the International Space Station. Portions of cremated remains of the deceased have been launched to space as a memorial and tribute to their lives. Currently, at least one company offers this service. Here is a sample of stores that sell space related items. Note that many science museum shops will sell such items as well. Online shop for space gifts including including toys, figures, space food, etc. They also have a special section of space party items. This Seattle museum emphasizes aviation but has some space items as well. Check out the giftshop for their space merchandise. Unfortunately the Air & Space Museum doesn't seem to have an online gift shop of its own. However, the Smithsonian Store has a number of space related items. Note that the store in the Smithsonian National Air & Space Museum itself is very large and offers a huge variety of space items. The Space Toys store offers a wide range of space related toys, models, clothes, and more. See also the sister store at SkyScopes Space Exploration Information and Products. The Space StoreTM was begun as a family business owned and operated by Dayna Steele-Justiz, a radio talk show host in Houston, and Charlie Justiz, a research pilot for NASA. The SpaceStore eventually became part of Spacehab. However, it is still run by Ms. Steele. The San Diego Space Society opened this storefront in July 2010. The storefront is designed like a small gift shop, selling posters, T-shirts, and even space suits—currently modeled by a mannequin that Clark has nicknamed Marsha White. More importantly, the Emporium will offer tickets for suborbital flight—near-space sightseeing flights set to begin by 2015—for the hefty fee of $100,000 to $200,000 a person. a library for Space Society members and a space-travel supply shop and will host Space Society workshops, meetings and events. Sounds like a great place for space enthusiasts to hang out. Kennedy Space Center - Space Shop - The Kennedy Space Center Visitors Center has a large space gift shop that now provides online catalgo. ShopNASA.com - offers items from the JSC visitors gift shop. SpaceTrader - Space Center Houston - the shop for the company that runs the JSC visitors' center. Collectables NASA Special And Rare Editions. Flown In Space. Display Desk Models And More. This store in Portugal and Spain offers space gifts, SpaceShipTwo reservations, weightless trips on ZERO-G flights, etc. Online shop for space items including art, books, music, and more. Space toys, dressing up costumes, kids spacesuits, astronaut food, cool space stuff! Edinos - Dinosaur, science, space, toys, books, posters, nature and gifts. Lunar & Planetary Institute - Online Store - offers books and reports generated by this famous research institution. Space County Souveniers - Located near Vandenberg AFB, Space Country "supply image products in support of government and commercial space programs. Space Country Souvenirs is a leading producer and wholesale distributor of space program patches, emblematic jewelry, caps, t-shirts, and other memorabilia for NASA, the aerospace industry, the military, dealers, gift and souvenir shops worldwide." The following space shops specialize in areas such as clothes or in items that support a particular project. Some of these are general stores that have a specialty sideline not offered by many other general stores. Astronomy - telescopes, astronomy pictures, etc. Art - space art galleries where you can purchase originals as well as prints andposters. Books - Check out the books section for links to bookstores, book lists, and sites dedicated to books for particular space topics. Collectables & Memorabilia - shops selling everything from space artifacts to meterorites to space stamps. Space DVDs/Videotapes - the multiple media section provides a long list of sites to buy space documentaries, historical footage, etc. Space CDROMS - the multiple media section also lists various interactive space CD's. Support space development by shopping at the stores of the organizations fighting to make it happen. AMSAT Catalog - Then AMSAT_NA offers items related to amateur satellites and space radio. DestinySpace.com - portion of the proceeds of space tourism apparel sales go to support space organizations. Mars Society Store Support the Mars Society and its efforts to promote Mars exploration by shopping at its store for books, videos, etc. The Planetary Society Store - Posters, calendars, science kits, and other items related to space science and planetary exploration. SSI Products - The Space Studies Institute offers books and souvenirs related to space colonization. This company provides an on line store of DVDs with a wide range of space documentaries, historical footage, and other space related video. In addition, some productions are enhanced with "high-quality computer generated images matched to actual mission audio to provide stunning realizations where video or film footage doesn't exist." Here are pens with space related designs. Learn about and purchase the famous Fisher space pen that was developed for NASA. It is "a ball point pen that will write smoothly in a vacuum. at any angle, underwater, over grease, in hot and cold temperatures, with an estimated shelf life of over 100 years." Lunar posters, maps, atlas, etc. Tranquility Posters - " dedicated to reproducing the most stunning images of modern history in art quality poster format. Each image is paired with the insightful words of great visionaries that, when combined with the images, give more profound meaning to both." SpaceShots - sells various space and remote sensing images as prints and posters. SpaceToys - sells astronomy posters, cards and photos, wall murals and more. AllPosters offers some astronomy and other space related posters. Anydate.com offers full page reprints of newspaper coverage of John Glenn Orbiting Earth and the Apollo 11 Moon Landing. Newspapers include the Baltimore News-Post, the Wisconsin State Journal and the New York Times. Artifactory Replicas - From the Ground Up - makes and sells reproductions of NASA blueprints taken from source materials in the public domain. They call them Aero Art Prints. The "digitally enhanced prints eliminate water stains, wrinkles, and tears, resulting in a pristine work of art". Astrographics - Astronomy, remote sensing, and other types of space photos, posters and calendars. Rockets of the World posters at Saturn Press. Depict 155 rockets at a constant 1/300 scale. Space Universe - Space Images, Hubble Photos, etc. SpacePhotos.com - "More than 40 000 Astronomical and Space pictures on our site, all available in superb High Resolution prints for professional or private use. Also find many other products on the subject of Space (the famous Space Pen, Scale Models, Telescopes, Slides, Astronomy maps, etc.)." Space Images - Beautiful photos from NASA's Hubble, Space Shuttle, and Apollo programs. USGS Store - maps of Mars, Moon, etc. for sale. Wall Murals by Environmental Graphics - offers some space related murals. Zazzle.com - beautiful 3-D, ray traced characters, sci-fi scenes, etc. B-agitator - a Finish store that offers shirts, hand-bags and patches with Yuri Gagarin image embroidered on them. Brain Waves - Intelligent Toys - includes rockets and space toys. LEGO Life on Mars - Lego has many space oriented kits including several around the theme of Mars. Powersof10.com - CDs and posters showing the whole universe down to the sub-atomic world as distance scales in powers of ten. SkyImageLab - "Digitally mastered astronomy photos and images of the Earth, its Sky, the Planets and their Moons, our Star, the Stars, our Milky Way, and Galaxies near and distant...."
The Space Elevator Store - books and collectibles related to space elevators. SpaceShirts - Get your space T-shirts at "Space Shirts your one stop online shopping for space T-Shirts, and collectibles." Space Shuttle Tile Company - souvenir samples of shuttle thermal protection tiles. Star Chronicles - VHS/DVD animated video producedby Charlie Case in collaboration with space music artist Jonn Serrie. SpaceJunkCafe.com - lots of NASA related items such as framed shuttle tile with poster, mugs, calendars, clocks, etc. Trans Lunar Research - Moonshop - support the development of a lunar base with purchases at TLR's shope. SimplePastTimes - jigsaw puzzles, games, etc. Year in Space Calendar- Desk calendar with images and articles about Space.